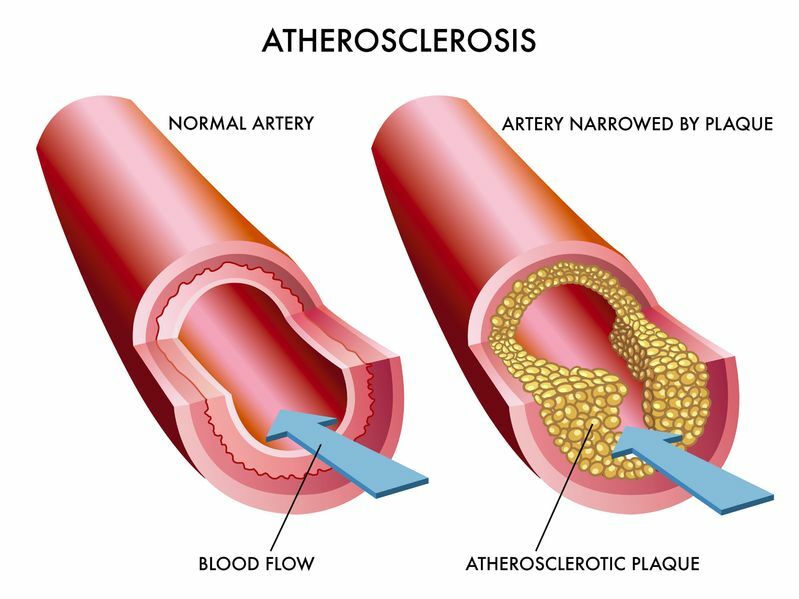 Atherosclerosis is the process where cholesterol, fatty substances, calcium, and dead cells build up on the inner walls of arteries. It mostly affects medium and large arteries. In a normal process of aging the formation of plaques and deposition of foreign matter on the walls of arteries occurs after the age of 65. Blood vessels then rapidly age and atherosclerosis significantly shortens life expectancy. Only when it comes to its advanced stage when it is significantly clogged artery disease shows its symptoms. Atherosclerosis symptoms are very similar to the symptoms of a heart attack or angina pectoris, those are: Strong chest pain (angina pain), a constant feeling of pressure and discomfort that indicates that the heart muscle is not supplied with sufficient oxygen and that there is probably clot. This discomfort can be expanded in the areas of arms, shoulders and neck. Agonizing pain occurs even due to emotional stress. When you have narrowed and clogged neck arteries you can experience the symptoms of stroke (due to lack of oxygen to the brain). They are manifested as nausea, dizziness and sudden numbness. In the case of congestion of the lower extremities occur the following atherosclerosis symptoms: severe pain, stiffness and serious infection is not rare. What can be done to prevent, stop or even slow the first symptoms of atherosclerosis? With the constant medical control, help yourself medicines from natural pharmacy and learn the basic rules for the daily regimen of diet. Atherosclerosis diet means you can replace as much as possible animal fats with vegetable oils. Vegetable fibres are extremely important for the health of your blood vessels. Meat has to be completely thrown out, or limited to fish and chicken but not fried but cooked or slightly steamed. Eat food from a Mediterranean menu and remove: liver, brain, cream, and limit eggs to a maximum of 2 times a week. Limit your sugar intake and industrial foods containing large amounts of trans-fats. The most dangerous are: white flour, refined salt, white sugar and lard. You will help yourself by using diverse prepared meals and salads of fruits and vegetables, and wild growing plants, which carry immeasurable power of the earth and the sun and are able to stimulate the body to ward off everyday problems and disease. Here is the list of the most desirable of vegetables, fruits and herbs that deserves your attention: dill, plantain, leek, onion, garlic, zucchini, juice of fresh cabbage salad, pickled cabbage, mashed beans, salad with fresh beets, lemons, oranges, grapes, apples, berries, blueberries, raisins, dried apricots, etc. One simple recipe comes from Russian natural medicine: eat 300 grams of apples every day for half a year. Juice of fresh cherries is also a great cleanser of fatty deposits on the walls of blood vessels. During winter cherry is substituted with grapefruit juice. Wash the radishes, scoop the middle out of it and add honey and cover with pieces of radish. Let it stand in a suitable container for 4 h in a warm place. When the liquid is poured out it is ready for use. Take half a cup a day, if you have gastritis, you are advised caution with this drink (be sure to consult with your doctor). For the treatment of atherosclerosis in severe cases it is necessary to take into the account the digestion and additionally clean the intestinal tract using enemas. If your stomach does not tolerate garlic, try the beads, dragees or obtain garlic drops. Prepare the mixture and drink it in the morning before eating. This drink contributes to the improvement of the condition of the body - it gives you strength, mobility, working enthusiasm and eliminates chronic fatigue. If you have atherosclerosis symptoms do not falter and despair. Psycho condition of the patient is of immense importance. Life joy and willpower are the most important for healing of this and other in other diseases. Pearson affected by atherosclerosis must strive to maintain the sharpness of thought and must be engaged in intellectual work, such as art and science, of course, to the extent that they are available to the person. No matter the years know that the very desire to be healthy and vital, is of great importance! We recommend that you read the texts: lack of iron in the blood, how to massage the body, kefir fungi for health, which are the first symptoms of breast cancer, etc.